From looking at this sandwich, would you think it was healthy? I have to tell you that is was absolutely both! 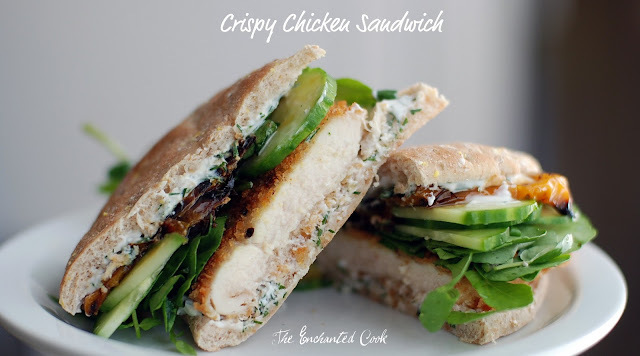 Who knew a "regular old chicken sandwich" could taste so good? 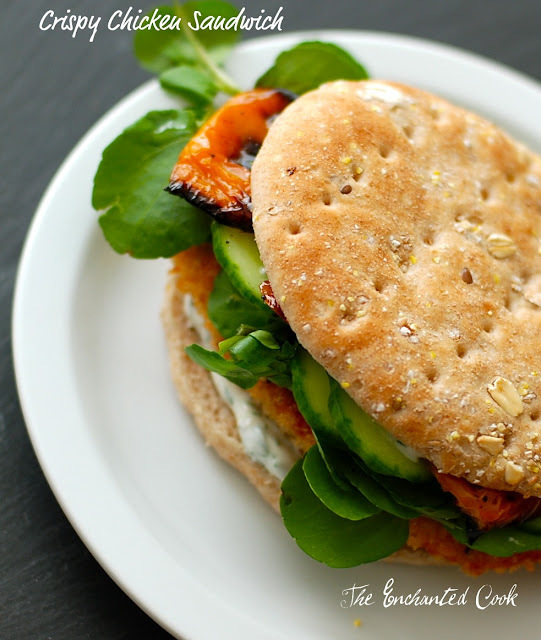 Tender, juicy chicken breast with a crispy coating topped with a lemon dill yogurt sauce, and layered with sweet and tangy roasted bell peppers, crisp cucumbers, and sharp watercress on a multi-grain bun...yummmmm. I could not get enough of this sandwich. I saw this in the March issue of Clean Eating magazine. This was the first time I've picked up this magazine and there are several things from this issue I'd like to try. I totally identify with their philosophy - "consuming food in its most natural state, or as close to it as possible..it's not a diet, it's a lifestyle approach to food and its preparation, leading to an improved life - one meal at a time". I prepared the lemon dill yogurt sauce and toppings in advance so that once the chicken was ready the sandwiches were quick to assemble. 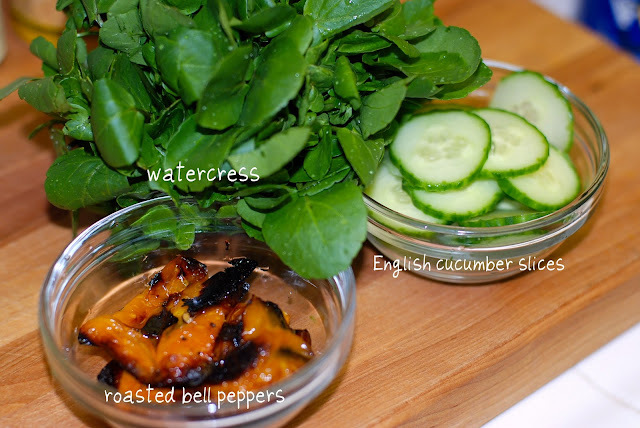 Place all ingredients in a small bowl and mix together. Cover and refrigerate until ready to use. Gather 3 shallow bowls. In 1st bowl place flour. In 2nd bowl place egg whites and Dijon Mustard and whisk together. In 3rd bowl place Panko bread crumbs. Season all 3 bowls with a small amount of sea salt and freshly cracked black pepper and mix each. Dredge each chicken cutlet first in flour, then in egg white mixture, then in Panko crumbs and press to coat completely. Place coated cutlets on a plate. Next heat a non-stick skillet to medium-high and add oil. Gently add coated cutlets to skillet and cook for approximately 3 minutes per side or until browned and fully cooked (no longer pink) on the inside. Remove and place on a paper towel lined plate. 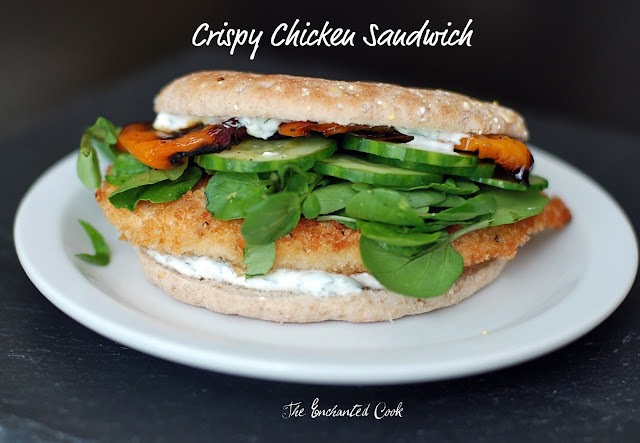 Spread lemon dill yogurt sauce on both sides of multi-grain buns, then place one crispy chicken cutlet on each bottom bun and top with watercress, cucumber and roasted peppers. Cover with top bun and serve immediately. Cook's Note re: Chicken Cutlets - If you cannot find chicken cutlets, just purchase boneless skinless chicken breasts and slice each horizontally into 2 thin pieces. Cook's Note re: Roasted Bell Peppers - You can easily use jarred roasted bell peppers but if you have an extra bell pepper or two laying around, why not roast yourself? To roast, heat oven to 425 degrees F, place sliced bell peppers with stem and seeds removed on parchment-lined baking sheet. Drizzle with olive oil and sprinkle with sea salt and fresh cracked black pepper. Roast in oven until tender and caramelized, approximately 30 - 45 minutes. There's nothing like fresh, warm roasted bell peppers all tangy and slightly sweet from the natural sugars caramelizing in the oven. Yum! I love a good chicken sandwich! This looks so delicious. My kind of sandwich..love how you put it together, and of course amazing photos! By the way love your new photo..
Wow, that sandwich looks good. Too good to be healthy but tasting is believing so I'll have to make one. This is no "regular" chicken sandwich! This puts the restaurant stuff to shame. The yogurt sauce. The cucumbers. It all looks amazing! wow- that sauce and chicken breast look phenomenal- Thanks for sharing... Those bread thins are so great and healthy too! This is droolworthy! Pictures are great too. I just wanted to pop in again to let you know I have an award waiting for you on my site. Thank you for always tempting my taste buds and your incredible talent. This looks like a perfect spring time meal to eat out on the back porch :) I cant wait to try it once I get back home! I found your page on foodgawker and so happy I did. This sandwich was soooooooo good my whole family enjoyed it. Left them wanting more this will be going in my cookbook thank you so much you just landed yourself another follower keep them coming..... Another thing it was very easy on the pockets as well!! Your photos are outstanding. This sounds like a great sandwich. I would be happy if you would link this to Let's Do Brunch. This sounds like a popular recipe.